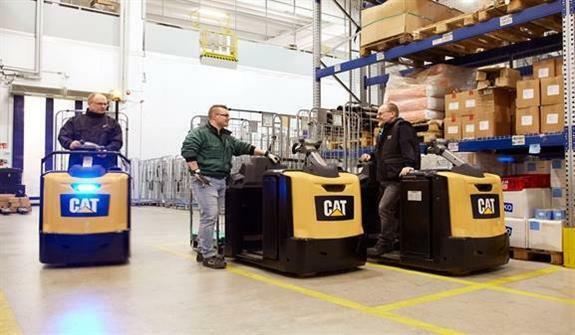 Optimum use of energy has been the designers' focus in developing the new NO-N2 range of low-level order pickers from Cat® Lift Trucks. As well as delivering the best energy efficiency in the market, they energise drivers by reducing fatigue and boosting every aspect of order picking performance. Energy consumption is 14% lower than that of their nearest rival in the first- and second-level picking class, and they are significantly more efficient across all operating speeds. Operators are empowered by advanced steering functionality, building on the Responsive Drive System (RDS) technology pioneered in recent Cat electric counterbalance trucks. A key outcome is the order pickers' unique intelligent curve control, which reacts rapidly to the operator's steering behaviour and travel speed. The system constantly adjusts sensitivity, cornering speed and angle limitation to meet changing needs. Steering control characteristics are modified when reversing, to allow for the driver's sideways position and one-handed operation. 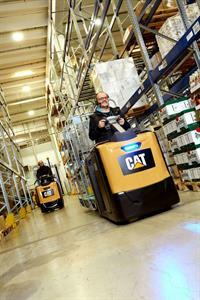 'Walk-by-side' operation, giving a clear view of the fork ends, can be controlled via the steering wheel, with angles automatically limited for safety. Faster transport between picks is enabled by a 'flying start' function. It allows the operator to begin acceleration from the walk-beside position, before stepping onto the presence-detecting floor mat. Once onboard, full acceleration is permitted. Other electronic-controller-based performance aids include advanced traction control, which ensures smooth, rapid acceleration and prevents wheelspin - and related wear - when driving on slippery surfaces or carrying heavy loads. The trucks' regenerative braking is optimised to eliminate swaying effects at full stop. It combines with a hill hold function and anti-lock brakes to help the driver operate smoothly, confidently and safely in all conditions. Perfect positioning is possible thanks to easily controllable and predictable deceleration rates and stopping distances. To save time when stepping on and off the truck, or walking through it, the spacious operator compartment offers wide, unobstructed access, a low step height, a non-slip mat and an absence of tripping hazards. Its high-comfort, triple-suspension floor features a floating structure to dampen shocks and vibrations, sideways dampening to relax knees and ankles, and thick state-of-the-art matting to reduce microvibration. Ergonomically shaped accelerator triggers and other controls are integrated into the innovative steering wheel and are easily reached by the driver without releasing his or her grip. The steering unit benefits from vibration damping, is effortless to operate with either hand, and can be adjusted for height and angle to maximise comfort. The NO-N2 six-model range offers 1.2, 2.0 and 2.5 tonne capacities, along with a variety of rising fork and rising operator platform versions for different applications. The trucks also come with a long list of optional features and accessories. For reference, the full designation of the range is NO12N2F(P)/NO20-25N2(P)/NO20N2X(P). 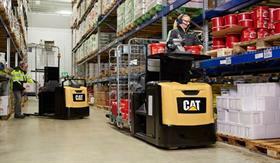 For further information on Cat® Lift Trucks, warehouse equipment and related services, please visit www.catlifttruck.com. See them in action via www.catlifttruck.com/videos. Keep up-to-date with the magazine for the materials handling professional, available online: www.eurekapub.eu.